Four years on, phone-hacking scandal is still growing ! Four years after the phone-hacking scandal at the News of the World saw the newspaper's former royal correspondent, Clive Goodman, jailed, the story refuses to die. Each week another celebrity launches a legal action against the paper, generating a fresh batch of damaging allegations that Rupert Murdoch's media empire could do without. The Observer has established that at least six people have issued proceedings against the paper, with potentially scores more in the pipeline. The problems for the tabloid, however, are not confined to these cases. Eleven people are taking separate legal action against Glenn Mulcaire, the private investigator at the heart of the scandal, who is appealing against a decision to make him divulge which journalists on the paper paid him to hack phones. Until this case is resolved – the court of appeal is expected to hand down a judgment in May – many outstanding issues cannot be addressed. "It's vital that the court of appeal acts to break the logjam and holds Mulcaire's appeal immediately so this can be can be resolved," said Paul Farrelly, an MP on the culture, media and sport select committee, which conducted an inquiry into the affair. Questions have been asked about how Mulcaire is financing his appeal. News International, the Rupert Murdoch company that owns the News of the World, has declined to comment. If Mulcaire were to confirm that other journalists were involved in phone hacking, serious questions would be asked about how Andy Coulson, the prime minister's director of communications, who was editing the newspaper at the time, could have been unaware of the practice, as he maintains. Earlier this month it emerged that the paper's news editor, Ian Edmondson, had been suspended amid allegations relating to the hacking of actress Sienna Miller's phone. 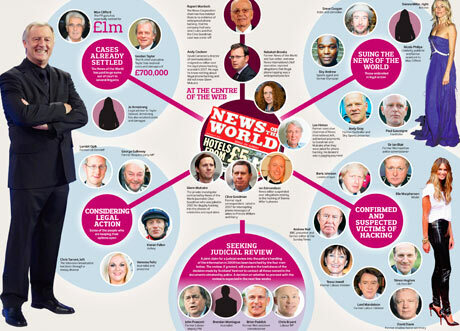 There is speculation that, if the names of other journalists on the paper were to be confirmed by Mulcaire, it would bolster claims that phone hacking by the publication's staff was systemic – something that might provide a tipping point in Coulson's career as a spin doctor. Many close observers of the saga have long been puzzled as to why it was that only Goodman was charged. In addition to pleading guilty to hacking royal aides' phones in the original criminal trial, Mulcaire pleaded guilty to hacking the phones of five other celebrities. In his summing up of the case, Mr Justice Gross, the presiding judge, said of Mulcaire that in relation to these counts "you had not dealt with Goodman but with others at News International". As the culture, media and sport select committee observed, there was no further investigation of who those "others" might be. "We are concerned at the readiness of all of those involved – News International, the police and the PCC [Press Complaints Commission] – to leave Mr Goodman as the sole scapegoat without carrying out a full investigation at the time," the committee inquiry concluded. The Crown Prosecution Service explained that to have trawled all of Mulcaire's files would have made the case "unmanageable". The CPS said such decisions were routine "in cases where there is a large number of potential offences" and added that "for any potential victim not reflected in the charges actually brought, it was agreed that the police would inform them of the situation". But questions are being asked about whether the police informed all potential victims that they may have been targets: and, if not, why not? Some have gone as far as to suggest that, if revealed, the full extent of the hacking would jeopardise the close relationship some Scotland Yard officers have enjoyed with the News of the World. A small group of suspected phone-hacking victims – including Lord Prescott, the former deputy prime minister, and former deputy Met police commissioner and London mayoral candidate Brian Paddick – is seeking a judicial review into Scotland Yard's handling of the investigation. Prescott's lawyer, Tamsin Allen, believes there may have been thousands of victims. An estimated 3,000 numbers were listed in documents seized by police in 2006. Even taking into account the possibility that some victims may have had multiple phone numbers, it means there could still have been between 1,000 and 2,000 victims, something that would further undermine the News of the World's claim that the hacking was the work of one rogue reporter. "We didn't believe that there was only one rogue reporter involved," Farrelly said. "Now all of these civil actions are chipping away at this defence, which is completely risible." Far from signalling an end to the newspaper's problems, it seems Goodman's conviction was only their beginning.